People generally expect bartenders to serve certain drinks in certain kinds of glasses. The problem is that there are more standard bar glasses than most people (and many bars) care to purchase. 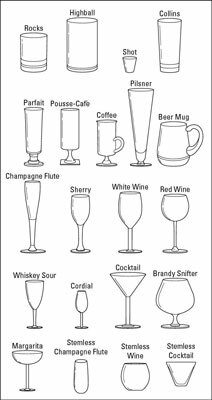 Brandy or cognac snifter: These are available in a wide range of sizes; the large, short-stemmed bowl should be cupped in the hand to warm the brandy or cognac. Champagne flute: The bowl is tapered to prevent bubbles from escaping. Cocktail or martini glass: Perfect for Martinis, Manhattans, Stingers, and many other classic drinks, this glass is available in 3- to 6-oz. sizes. Cordial glass: In addition to cordials, you can use this glass to serve straight-up drinks. Highball and Collins glasses: These glasses are the most versatile. Sizes range from 8 to 12 oz. Red wine glass: This glass is available in 5- to 10-oz. sizes. Note that the bowl is wider than the bowl of a white wine glass, allowing the wine to breathe. Rocks glass: Also known as an old fashioned glass, sizes of this glass vary from 5 to 10 oz. Use the 5- or 6-oz. variety and add plenty of ice. Shot glass: You can also use the shot glass as a measuring tool. It’s a must for every bar. Stemless glasses: These glasses have become popular in recent years, probably because they look elegant, even if they aren’t as practical as the stemmed versions. White wine glass: This glass is available in 5- to 10-oz. sizes. Stick with the smaller wine glass. If you’re planning on creating a bar at home or serving cocktails at a party, keep your glass selection small. You can simplify by using two types of glasses: a white wine glass and a red wine glass. You can use these two glasses for every type of cocktail (including shots, even though a shot glass is essential for every bar), plus beer and wine. Also, if you use these two glass shapes, cleaning and storing your glasses is less complicated.